Ottawa, Ontario, Canada — November 4, 2013 — A new definitive history of the Easy-Bake® Oven has been released to celebrate the iconic toy’s 50th anniversary. First launched in 1963 by Kenner® Products, the Easy-Bake Oven was an immediate hit, selling all half million pieces the company produced and tripling sales the next year. The oven allowed children to take “playing house” to a fantastic level of realism by allowing them to bake and serve real culinary concoctions from a working toy oven. 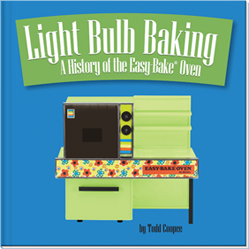 Author and toy historian, Todd Coopee, has published Light Bulb Baking: A History of the Easy-Bake® Oven, a richly photographed and researched homage to the toy. The book explores the innovation, history, economics, commerce, advertising, and marketing that led to the Easy-Bake Oven becoming one of the most popular toys in the world. The book traces the toy oven’s history from the genesis of the idea at Kenner Products, through numerous design and technology updates, marketing strategies, and acquisitions to its current life at Hasbro®. The book includes what is likely the first and only complete visual history of the Easy-Bake® Oven, including stunning photographs of every model of the toy, its colour palettes, features, and its many accessories. An ideal gift for toy collectors and nostalgic bakers, Light Bulb Baking (ISBN 978-0-9917484-0-2) is available in hard cover at online retailers such as Amazon.com and Barnes & Noble as well as the book’s companion website: lightbulbbaking.com. Author Todd Coopee is available for media interviews.